In addition to publishing novels, Baggott is a highly anthologized and award-winning poet. Her fourth collection, Instructions: Abject & Fuming, was published in February 2017. Her poems have appeared in Best American Poetry, Poetry, The American Poetry Review, Agni, TriQuarterly, The Southern Review, Ms. Magazine, and read on NPR’s Talk of the Nation and at Symphony Space. 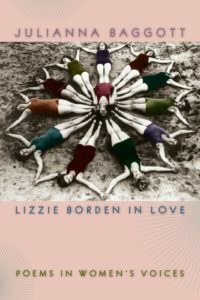 A collection of poems that takes on threads of abandoned English and twisted forms to address contemporary culture, faith, and feminism. 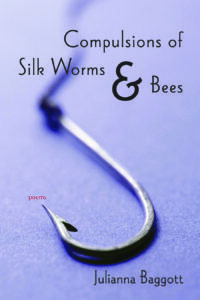 Compulsions of Silkworms and Bees, Pleiades Press/ Louisiana State University Press, 2007. 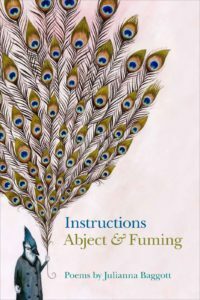 A collection of poems in the tradition of Rilke’s Letters to a Young Poet, except written on poetry’s own terms, in a book of poems. A highly researched collection of poems written in the voices of historic women. This Country of Mothers, Southern Illinois University Press, 2001. A collection of poems that arose from the betrayal of motherhood. Crab Orchard Award Series, Prize Winner. 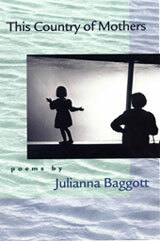 To receive a free .pdf version of Julianna’s first collection of poetry, This Country of Mothers, send a request here.